Last seen in Bali. We think the team looks somewhat different in Sugapa today. We look forward to seeing their photos soon. Brent called us today at the end of a long day, the final day of trekking for the Carstensz team. Brent’s satellite call was broken, but we understood enough to get the gist of the story for today and to know that the team is resting back at Sugapa. The walking is now over. The rain was continuing through the night last night and this morning the river had swollen so high that an alternative route of descent had to be taken. This is wild trekking in the jungle. Some climbers who have gone to Carstensz have described it as the hardest trek that they have done anywhere in the world. Brent, Proxy and the team got out no problem however. By late in the afternoon they had gotten to the end of the road, where they are able to catch a ride on motorcycles down the final mud road section into Sugapa, where the airstrip is located. Brent described that they were absolutely soaked when they finally arrived. 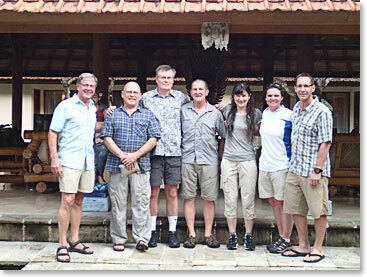 This team had remarkable good luck with weather for the trek in and for their ascent of Carstensz Pyramid itself. The drenching that they got on the way out was not unusual at all for New Guinea; we suppose that no Carstensz climb is complete without at least a couple of good drenchings. Perhaps it would have been a shame if all the climbers had gone home with clean, unused Wellington mud boots. In hindsight it is clear that there was no way that was going to happen. Congratulations to a great team for a great adventure and climb. Who knows what will happen tomorrow? We are way ahead of schedule so “it is all good” – perhaps a flight will allow the team to continue on to Timika and even on to Bali on Monday!! Perhaps it will be time to hang in the rain in Sugapa. Either way the team has successfully reached “the end of the trail.” We will keep you posted. Be sure to keep checking these dispatches, because soon we will have the actual photos of this team on this Carstensz trek and climb. All the photos illustrating the dispatches so far are archived photos from previous years. We are looking forward to seeing the sun, forest, mud, rock, vegetation, the Dani porters and especially the smiles of this remarkable group of climbers.